When should parents tell their child about a genetic mental illness that runs in the family? At puberty? Possibly. Maybe when the turn 18? Probably. But definitely before they leave for collage. Especially when they are pretty darn certain their child has the illness. Now don’t get me wrong telling Thelma might not have changed the course of events, but certainly they would be less culpable in what happened during her first semester of collage. 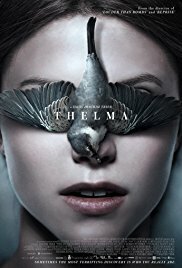 I watched Thelma on Hulu and could not get it out of my mind. It is my favorite movie that I streamed in 2018. The acting and writing are superb. It is like a cross between a Twilight Zone episode and a sweet coming of age story. If you like independent films or weird little foreign films, then you should definitely check this out.